From Hodenpyl Dam Pond the Manistee River winds south uninhibited and free in the Manistee National Forest for 13 miles before a road crosses it. Unmolested by bridges, cottages and dams, this wild stretch of Michigan's third-longest river appeals not only to paddlers and anglers looking for trophy trout but also to hikers. On the east side of the river lies the Manistee River Trail, on the west side a portion of the North Country Trail. 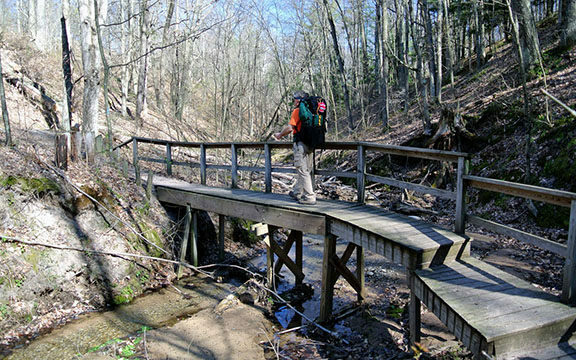 Together those trails can be combined into a 23-mile loop that has become the most popular backpacking trek in the Lower Peninsula. 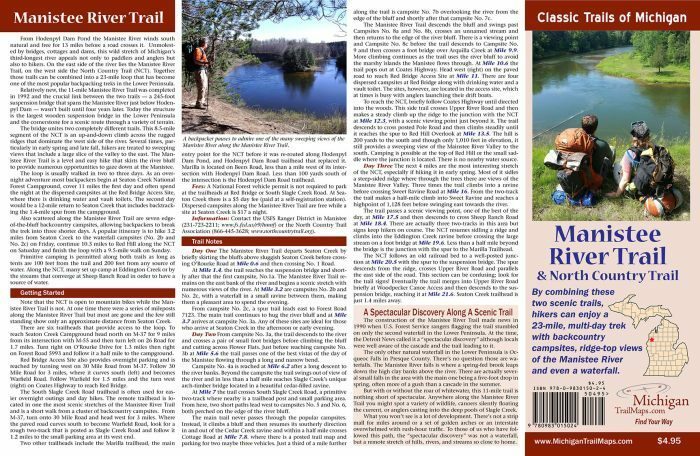 Click here to order a detailed map and a guide to the Manistee River Trail from the MichiganTrailMaps.com eshop. From Hodenpyl Dam Pond the Manistee River winds south uninhibited and free in the Manistee National Forest for 13 miles before a road crosses it. Unmolested by bridges, cottages and dams, this wild stretch of Michigan’s third-longest river appeals not only to paddlers and anglers looking for trophy trout but also to hikers. On the east side of the river lies the Manistee River Trail, on the west side a portion of the North Country Trail (NCT). Together those trails can be combined into a 23-mile loop that has become the most popular backpacking trek in the Lower Peninsula. This adventure is relatively new. The 11-mile Manistee River Trail was completed in 1992 and the crucial link between the two trails — a 245 feet suspension bridge that spans the Manistee River just below Hodenpyl Dam — wasn’t built until four years later. The foot bridge, the largest wooden suspension bridge in the Lower Peninsula, serves as the cornerstone for a scenic route through a variety of terrain that features numerous viewing points. The bridge also unites two completely different trails. The 8.5-mile segment of the North Country Trail (NCT) is an up-and-down climb across the rugged ridges that dominate the west side of the river. 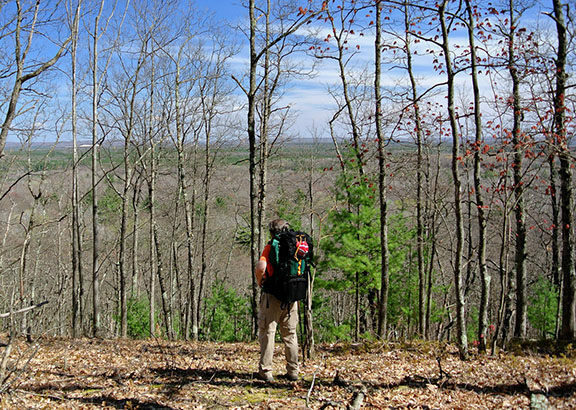 Several times, particularly in early spring and late fall, hikers are treated to sweeping views that include a large slice of the valley to the east. 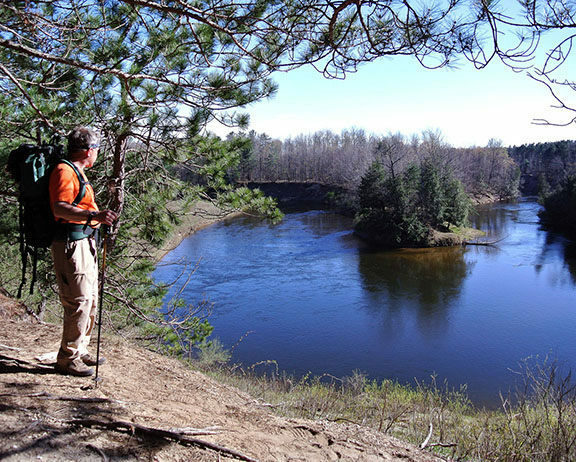 The Manistee River Trail is a level and easy hike that skirts the river bluff providing backpackers numerous opportunities to gaze down at the Manistee flowing through horseshoe bends. The loop is usually walked in two to three days. As an overnight adventure most backpackers begin at Seaton Creek National Forest Campground, cover 11 miles the first day and often spend the night at the dispersed campsites at the Red Bridge Access Site, where there is drinking water and vault toilets. The second day would be a 12-mile return to Seaton Creek that includes backtracking the 1.4-mile spur from the campground. Also scattered along the Manistee River Trail are seven backcountry campsites with a fire ring and a view of the river below. Two of them are located near a waterfall. These are scenic places to spend a night and allow backpackers to break the trek into three shorter days. 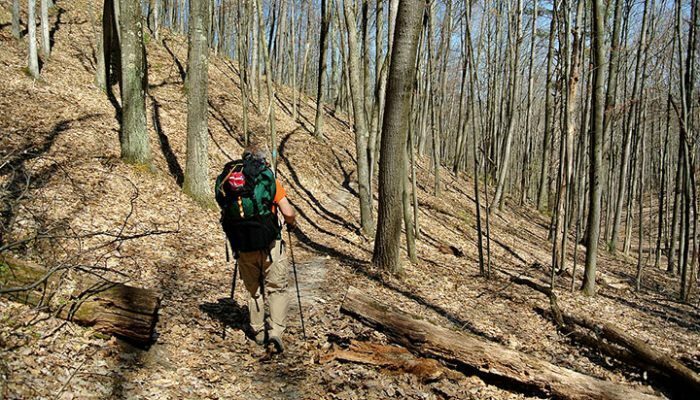 An ideal weekend outing is to hike the 3.2 miles from Seaton Creek to the waterfall campsites on Friday, continue 10.3 miles to camp at Red Hill along the NCT on Saturday and finish the loop with a 9.5-mile walk on Sunday. Primitive camping is permitted along both trails as long as tents are 200 feet from the trail or any source of water. Along the NCT, many set up camp at Eddington Creek or by the streams that converge at Sheep Ranch Road in order to have a source of water. Red Hill is also a popular place to camp but water needs to be carried in as there is no nearby source. 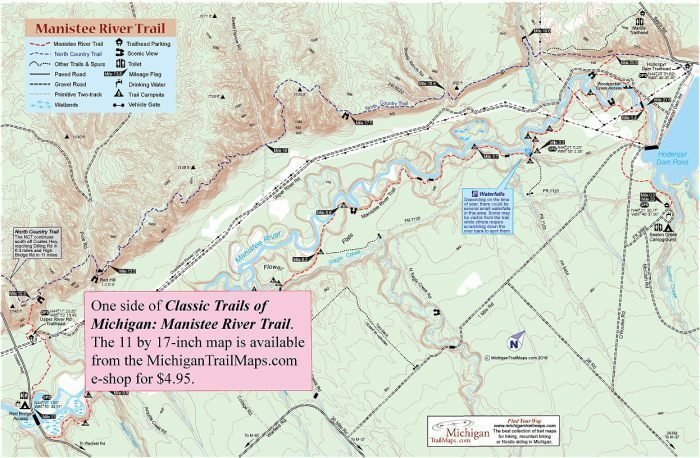 Click here to order a detailed map and a guide to the Manistee River Trail. Contact the Manistee County Convention & Visitors Bureau (877-626-4783; www.visitmanistee.com) or the Traverse City Convention & Visitors Bureau (800-872-8377; www.traversecity.com) for lodging and accommodations in the area. A National Forest vehicle permit is not required to park at the trailheads at Red Bridge or South Slagle Creek Road. At Seaton Creek there is a $6 day fee (paid at a self-registration station). Dispersed campsites along the Manistee River Trail are free while a site at Seaton Creek is $14 a night. There are six trailheads that provide access to the loop with Seaton Creek Campground serving as the main one. To reach Seaton Creek Campground head north on M-37 for 9 miles from its intersection with M-55 and then turn left on 26 Road for 1.7 miles. Turn right on O'Rourke Drive for 1.3 miles then right on Forest Road 5993 and follow it a half mile to the campground. Red Bridge Access Site also provides overnight parking and is reached by turning west on 30 Mile Road from M-37. Follow 30 Mile Road for 3 miles, where it curves south (left) and becomes Warfield Road. Follow Warfield for 1.5 miles and the turn west (right) on Coates Highway to reach Red Bridge at the Manistee River. The South Slagle Creek Road trailhead is often used for easier overnight outings and day hikes. 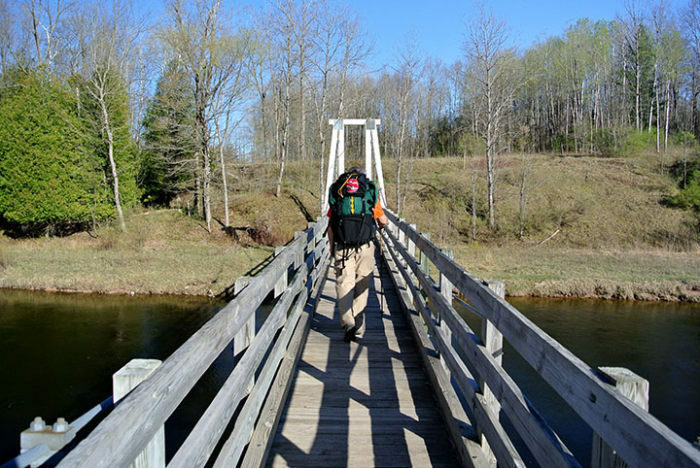 The remote trailhead is located in one the most scenic stretches of the Manistee River Trail and is a short walk from backcountry campsites No. 8 and No. 9. To reach South Slagle Creek Road from M-37, turn onto 30 Mile Road and head west for 3 miles. Where the paved road curves south to become Warfield Road, look for a rough two-track that is posted as Slagle Creek Road and follow it 1.2 miles to the small parking area at its west end. The best source of information is the Manistee Ranger District of the Manistee Forest (231-723-2211; www.fs.fed.us/r9/hmnf). For more information about the NCT contact the North Country Trail Association (866-445-3628; www.northcountrytrail.org).